Members of Northern California's Japanese American community gather to present their 46th Annual Cherry Blossom Festival. Anyone with a yen to experience a bit of Japan won't want to miss this wonderfully vivid and varied cultural feast, which celebrates the rich heritage of Japanese Americans. 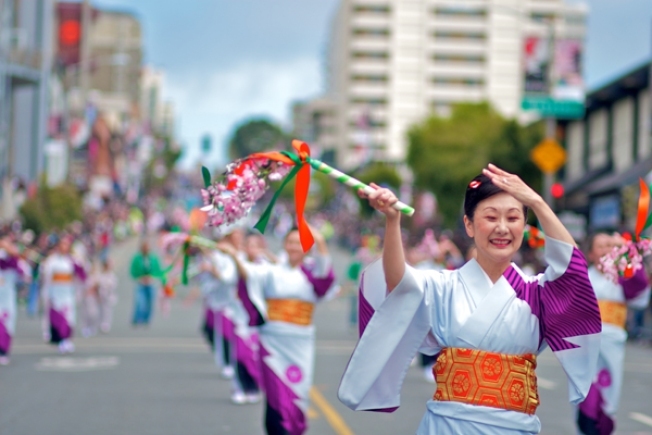 The five-acre Japan Center, at Post and Buchanan Streets, and the adjacent blocks of Japantown will be filled with exquisitely costumed performers and will echo with thunderous rhythms of huge taiko drums, ethereal strains of koto music, crackling of boards being splintered by martial artists, and the gentle sounds of tea ceremonies. Please check their schedule of events for a complete update of times and events. Everyone is invited to join in the festivities, which will be in full swing by 11:00am each day of the two-weekend celebration. Most events will be free!